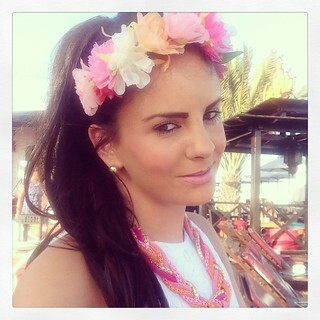 One of my favourite Summer trends that is still going strong since last year is the flower hair garland. Inspired by the festival trend, they have hit the high street this season in their hundreds with many different styles and colours available. I found this one in River Island and I had to have it. It really dresses up an otherwise casual outfit like the vest top from Topshop and pink shorts from Zara which I am wearing in the pictures. I finished the look with this necklace which I found at Playa Banca Market in Lanzarote for just €15, definitely the bargain buy of my holiday. As the days were passing by and my skin was becoming more and more tan I found that my MAC foundation was becoming increasingly too pale for my skin. I am obsessed with their Studio Fix Fluid as it gives perfect coverage for my skin which can be prone to break outs. Unfortunately MAC cannot be purchased anywhere in Lanzarote so I couldn’t get my hands on a darker colour and had to try something new. 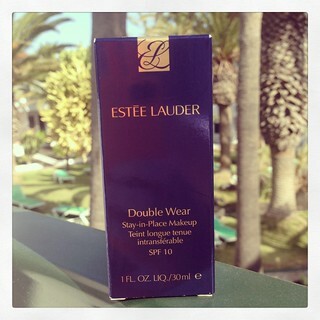 I went for the Estee Lauder “Double Wear” foundation as I had heard a lot about it. This particular evening was the first time I had tried it and although the colour was much better for my changing skin tone, I did find the consistency a little thick and hard to blend. It definitely did the trick for the rest of the holiday but I have since gone back to my beloved MAC makeup which seems to work perfectly with my skin type. I love your flower wreath! nice photos! i like that flower headband! Amei o look! Principalmente a sandália! Wow, nice look dear! I like your blog! I follow you on bloglovin, i hope you follow me back! You look so pretty … Lived your makeup and fliral headband..
you look good! of course we follow you, follow us! Gorgeous! LOVING that Louis Vuitton bag.. I love this gorgeous, colourful and feminine look! Cute look and I like your bag! Pink is totally your colour! I visit your blog and i like it! Loving your flower head band ! wow, u carry these so effortlessly.. Love the outfit too..
Stunningly beautiful! I absolutely love the outfit and the flowers are such a pretty touch! Followed you, follow me back love? Like the flower headband, beautiful! 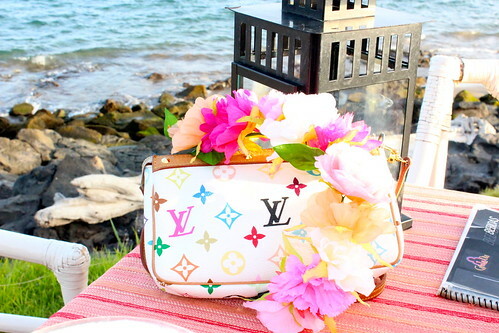 I love this bag and flower crown, too! Very pretty and the outfit looks so good on you! You look so hot, not everyone can pull this look. You rock the flower hair garland perfectly. I see most people rocking it with maxi skirts looking like bride's maids but you styled yours with shorts. Wow, i love your styling!!! Perfect. I'd love to have a headpiece like this. But I'd rather a purple, light blue and cream roses. It would match my skin and hair better 🙂 Love the blog btw. I love your floral crown!!!!!! i love the flowers in your hair! You look SO cute, I really like the short , such a fun & cute color.